Skittle Players outside an Inn by Jan Steen. Skittles is an old European lawn game, a variety of bowling from which ten-pin bowling, duckpin bowling, candlepin bowling (in the United States), and five-pin bowling (in Canada) are descended. In regions of the United Kingdom and Ireland the game remains a popular indoor pub game. A continental version is popular in Germany, Austria and Switzerland. Other varieties of bowling are more popular in Australia, but the similar game of kegel, based on German nine-pin bowling, is popular in some areas. In Catalonia, bitlles, a local version of this game, was formerly popular. The game shares its ancestry with the outdoor lawn game known as bowls and is thus distantly related to billiard sports, some of which also retain the use of skittles. The skittle dates to the earliest known forms of bowling and ground billiards, even as far back as c. 3300 BCE in Ancient Egypt. Skittles is usually played indoors on a bowling alley, with one or more heavy balls, usually spherical but sometimes oblate, and several (most commonly nine) skittles, or small bowling pins. The general object of the game is to use the ball(s) to knock over the skittles, either specific ones or all of them, depending upon game variant. Exact rules vary widely on a regional basis. In this variant of the game, pins are counted only if the front pin is knocked over first. If the front pin is missed, any pins that are knocked over are not reset. In Devon Summer League, this rule is played frequently. In Bristol, this is the form of the game played and "all in" skittles tends to be looked down upon as involving less skill. In Worcestershire this type of game is also known as king pin. In this variant of the game, the player has to nominate the pin that will be hit first before the throw. Unless this pin is knocked over, the player will not score. The names given to the pins may vary from region to region; in Wiltshire they are usually referred to as "front pin", "front right quarter", "front left quarter", "outside right" (or "right winger"), "centre pin", "outside left" (or "left winger"), "back right quarter", "back left quarter", and "back pin". In this variant of the game, only four pins (the two coppers, the front and back pins) are put up and must be hit with the front pin first. It is often used in conjunction with nomination as well. It is currently used in North Somerset Cup games. A game for any number of people. Each starts with 3 lives. Each bowls only one ball at a time. The first bowls at a full frame and the skittles are not stuck up until all nine are hit down. Each time a player fails to hit a single pin (but they can hit as many as they like), he or she loses a life. The winner is the last one left with a life intact. Usually played for money, e.g. £1 or 50p a game each player - the winner takes the pot. It is found in the Somerset and Bristol areas. Another game for any number of people. Each player has one hand of 6 balls at a full frame. If all nine pins are knocked down within the hand, then they are reset, meaning that a player may score anywhere between 0 and 54. The winner is the player with the highest score. It is similar to killer in that it is usually played for money with the winner taking the pot. Also known as Old English Skittles, the Greater London version uses nine pins (made of hornbeam) and a cheese. The cheese is thrown at the pins using a swinging motion whilst stepping forwards. After an initial throw, the remaining pins (the 'broken frame') may end up in a variety of formations - each of which has a distinctive (and usually London-based) name, such as a London Bridge or a Portsmouth Road. Knocking down all the pins at once is known as a 'floorer' and is highly respected. The last time a player is known to have thrown three floorers in succession was in 1960. While it was once a popular game played in pubs all over London (generally sited by the Thames river), it is now only played at the Freemasons Arms in Hampstead. The origins of this skittles game are vague, but it is thought by some to have been started by Dutch sailors, possibly playing on the decks of moored barges. In the Sarnia Skittles League of Guernsey, the teams are made up of six players playing five legs of three balls. Currently there are 25 teams playing across three leagues and each Team plays the others three times during the season. The season runs from September to April. In the Tewkesbury and District Skittles League, teams consist of 10 players playing 9 hands each. The league runs from early September through to the following April. The league was formed in September 1960. Each game has 10 points available with two points available for the first, second and third leg with another four for the match result. The highest ever individual score is 98 scored by Richard Booth for the Wye Emms team at Champagne Charlies on 15 March 2010. In the Stroud and District Skittle League, teams are made up of 10 players (Men's Sections) each having eight hands of three balls. In the Ladies Sections each team consists of eight players each having 10 hands of three balls. Games are played in two equal halves. The league runs from early September through to the following May. In the Cheltenham Skittles League, skittles is played with either a team of 12 (winter skittles) or six (summer skittles). Each player plays six hands of three balls. However, in Gloucester, the players play 10 hands of three balls, and a team is made up of 10 players. The Berkeley and District Skittles League was formed in 1957 and has in excess of 100 teams playing in seven divisions in a geographical area of around eight miles in diameter in the southern end of the county. Teams are made up of eight players and each player bowls eight hands of three balls. The pins (skittles) used in the League vary in size, but are between nine and 10 inches high and between four and five inches in diameter at the widest (centre) point and are either made of wood (traditionally sycamore or beech) or plastic. Balls are between four and a half to five inches in diameter and again are either made of wood (lignum vitae) or a composite rubber. Alleys, on which games are played, are between 30 and 55 feet in length and are generally of a wooden construction, although one alley is linoleum over a concrete base. The League runs from September through to the following April. In the Hereford & District Invitation Skittle League, skittles is played with either a team of 12 (winter skittles) or 6 (summer skittles). In the Winter league each player plays four hands of three balls, and in the Summer League they play six hands of three balls. The winter league comprises 70 teams competing in five divisions, five cups competitions (KO, Front Pin, Man v Man, Champion of Champions, and Charity eight-a-side) and also singles and pairs competitions. In the Devizes Skittles League, skittles is played with a team of 9 players. Each player plays 4 legs of 3 balls. 2 points are awarded for each leg won (1 point each for a draw) plus two points for the overall aggregate number of pins for a total of 10 points available. The team with the most points wins the match. The league runs from August to April. There are approximately 50 teams across 4 divisions, playing within a 5-mile radius of Devizes. There is also a Westbury Town mid-week league. Teams of eight players compete over 5 legs per game. The third division does not play using front pin rules. One of the best teams is the Rejects. They are reputed to be the friendliest team in the league. There is a lack of floppers - which is odd given their average age! The Malmesbury and District League is played with nine players per team, divided into three legs. Each player has six goes with three balls. Two points are awarded for each winning leg, and a further four points are awarded to the overall winning team, so ten points are available per game. Games typically last around 1 hour 40 minutes and are played Tuesday to Friday. This is one of the larger leagues in the area with 95 teams playing on 20 different alleys within a ten-mile radius of Malmesbury Abbey. The league begins in September and concludes in April, although various cup matches occur in August and April. The Swindon & District Friday Skittles League is played with twelve players per team, divided into four legs; hence, each is called a HORSE (because a horse has four legs). Points are awarded thus - 2pts per Horse, plus 6pts for winning. There are currently 36 teams in three sections. The league runs from September to June. There are Cup Knockout Competitions throughout the season. The top player with the average highest score is Andrew Huntley of Devizes, Wiltshire. The rules and team formats of "Somerset" skittles vary. Major skittles areas include Bridgwater, Wells, Yeovil, Taunton, Weston Super Mare, and Burnham-on-Sea. Bristol is also included in the "Somerset" skittles "set". Depending on where the leagues play, there may be 6 players per side (normally in summer leagues), or 8 per side (winter). There are mixed leagues (males and females in each team) and there are all male leagues and all female leagues. Traditionally, Somerset skittles uses wooden balls (made from apple wood or similar) and wooden pins. Times have changed and for various reasons, some alleys now use composite rubber balls and nylon pins. In North Somerset, teams are of 12 (winter leagues) and 9 (summer leagues). Players may be organised in sets of 3 or 4 (teams of 12 only, obviously). Bristol and North Somerset alleys have, in the past been known for their "camber". Some alleys were (and still are) raised in the middle, making bowling an accurate art. The pins are laid out in a diamond or 'frame', the lead or 'front' pin and behind it the middle or 'fat Annie' which is slightly wider at the girth than the rest of the pins, and the back pin- identical to the front pin. On each shoulder of the front pin are the 'quarters'- left and right, front and back. On the shoulder of the quarters are the outside 'copper' pins, left and right. In Bristol skittles, the front pin and the back pin are painted with a red band, top and bottom. The quarter pins are painted with a white band, top and bottom and the middle pin a single red band around the girth. The coppers are unpainted. There is enough of a gap between all the pins for the balls to pass through without knocking anything down. Pins vary hugely in size from team to team, league to league, but in Bristol skittles all are symmetrical and wider around the middle. Usually in the higher leagues the pins are much narrower and conversely in the lower leagues the pins wider, although not always the case. In Bristol skittles at least if a falling pin hits the side wall and rebounds back into the 'frame' taking down another pin(s) this is called a cush pin. It is left to the alley or home team to decide whether cush pins count towards the total scored or whether the frame needs to be reset, and should be published on the score board prior to play. However, if a ball leaves the diamond and bounces back before felling pins the frame must be reset. Skittles is played either front first or all-in. I.e., in all-in skittles each and every pin that is felled counts towards the total scored. In front first skittles, the front pin must be felled before any score is recorded. In other words, in a worst-case scenario, should one fell all pins except the front pin with one's first two balls (of three), the maximum score that one could record for that 'up' can only be 1 pin. In front first skittles the dreaded duck comes into play more often than in all-in skittles. This is where the front pin remains standing after one's 'up' despite any other pins being felled. This 'up' is recorded as a 'duck' or zero score towards one's total and is usually marked with a cross or an asterisk. Finishing a game with only ducks recorded is considered a big faux-pas! In Bristol skittles, this is the felling of the front pin, the middle pin and the back pin with one ball and is considered slightly bad luck because the remaining frame of pins offers less chance for a decent frame score with the middle column of pins felled. The term Old Market is thought to refer to the road Old Market Street in central Bristol, where the road is wide and straight and cuts a swathe through the densely populated buildings. A spare is scored when all pins are felled by the first one or two balls. In such a case the frame is reset and the player continues until all three balls have been rolled. The maximum score in a 9-pin frame is therefore 27, although this is extremely rare if not unheard of. On some alleys a 12-spare is not uncommon. Once the front has been felled the front pin of the reset frame does not need to be hit again. The Alley, Pin diamond, Pins and Balls. As with all variations of skittles the pins are laid out in a diamond and played on an alley, with the pins placed on painted squares known as plates. In the Worcestershire Leagues there is no set measurement for this, instead the size of the diamond should be 'not less than 3 ft 10in and no greater than 4 ft 2in'. The pins and balls are known as the 'Kit' and the balls should be made of Wood, Tufnol or Rubber and 'must not exceed five and a quarter inches in diameter and no less than four and three quarter inches in diameter'. Despite guidelines for the diamond and balls there is no uniform size of pin needing only 'to be uniform size and painted white, one and a half inches around the top. The Alley itself should be 'clean and well lit, with a bowling line approximately 33 ft to the front pin of the diamond'. However this rule is not strictly enforced with some alleys being shorter than others. The Alley itself can be either Lino or Wood. The front pin is known as the 'King' and is painted with a white, one and a half inch wide vertical stripe. The two pins to either side are known as the 'Quarter pins' and are marked with either a triangle or the numbers 1 and 2, in order to identify them. Traditionally the 'King' is the heaviest pin, with the 'Quarters' being heavier than the rest of the pins but not heavier than the 'King'. Directly behind the 'King' is the middle pin which is known as the 'Birdie', as the other pins form a 'cage' around it. The back pin sits directly behind the 'Birdie', the 'Back quarters' directly behind the 'Quarter' pins, and the 'Wingers' on the outside of the diamond. The 'Birdie', 'Back Quarters', 'Back Pin' and 'Wingers' are non-specific pins and are not marked so any of the six unmarked pins can be placed on any of the six plates. All balls must touch the Alley before the 'Line' to be deemed as legal. However the 'Linesman' (a member of the opposing team who sits and watches the line) must call 'Over' before the ball strikes a pin. If he fails to do this the pins felled will count. In Worcester skittles all pins are live until they land in the pit behind the diamond, or leave the alley on an open side. They can rebound off a side wall back into the diamond taking down other pin(s). In some alleys, such as the Saracens Head in Worcester, the Diamond is flanked by two side walls making the possibility of a spare, achieved by bouncing pins off the wall more of a possibility. It is more than common to hear the cries of 'let it roll' go out in the alleys of the city to stop an over enthusiastic 'sticker up' (a young lad or girl employed to put the pins back up after they have been knocked down) removing a pin from the alley before it has finished knocking down the others. However, if a ball hits the cush, or wall or passes through the diamond and bounces back out of the pit before felling pins the frame must be reset. A Player scoring no pins after bowling three balls in the leg is known as scoring a 'Spider'. A spider is recorded by drawing legs and a face onto the zero on the board and is greeted with delight when the opposing team returns to the alley. A 'Spare' where the pins are reset after being felled with balls to spare is denoted on the board by a circle drawn around the score. This is not greeted so favourably. The maximum score in a 9-pin frame is 27, however this is virtually unheard of, the highest spare in the history of the Worcester and District was thought to be a 24 scored by Gary Sandbrook whilst playing for the Independents Skittle team in the early 1990s, the highest spare in the friendly league was achieved by Scott Heywood with a full house score of 27 at the Alma tavern whilst playing for the Rushwick Cavalier on 18 September 2014. Spares are not uncommon however, and a good score in the Worcester game is 40 plus. The Worcester and District Skittle League, 12 players, playing 5 legs of 3 ball (winter league, men only, Tuesday nights) is the oldest skittle league running in the county, having been restarted post-war in 1946, and is a founder member of the Three cities Association. The Worcester and District is the county representative in the Three City Cup competition, played between Worcestershire, Gloucestershire and Herefordshire between September and May each season. The rivalry between the District and the younger Friendly leagues (WFSL) in Worcester has always been great; however, in season 2004/05 it was decided by the District League that players signed on for a team registered for their competition were free to play for a team affiliated with the WFSL. Up to that point playing for a team in the WFSL while being signed on to a team affiliated with the Worcester and District would lead to a lifetime ban from the District League. Until the end of season 2009/10 the scoring system was different for both leagues, with the Worcester and District League opting for the traditional 2 points for a win and 1 for a draw, and the WFSL opting for a system which awards 2 points for winning a leg and 10 points for the game, a total of twenty points. However at the start of season 2010/11 the same scoring system as the WFSL was adopted by the Worcester and District in order to increase the competitive nature of the League and hopefully stem the declining interest in the sport. In recent years, the popularity of Skittles has declined with the District League and WFSL both having to reduce the number of divisions from 5 down to 3. The District League compete for a number of cup competitions, with matches taking place on both Tuesday and Friday evenings. The premier cup competition being the Team Knock Out, but also the King Pin Cup (a variation in the rules applied so the front pin, or King pin as its known in Worcester has to be knocked over before scoring can commence) and the Mick Potter Memorial Trophy. There are also Singles (solo players) and Doubles (Teams of two) as well as a Six a side Trophy held each year. The County Cup is played between the representative sides of the WFSL, Worcester and District, Worcester Ladies, Malvern Men's League and the Malvern Ladies League. It is played on a Round Robin basis, with ten fixture dates (to include one bye), a play off, and a final. The Evesham League is not included, possibly due to too many rule variations (player v player format, mixed teams). Malvern Men’s Skittle League has been running for over 35 years within the Malvern area. This includes Great Malvern, Malvern Link, Madresfield, Barnards Green, Cradley, West Malvern, Hanley Swan, Colwall and Suckley. League and Cup games are played on Thursday evening’s, over a 42-week period beginning in September running through to the following June. With over 400 members from 31 teams who meet with their friends and team mates to play skittles; this makes Thursday night one of the busiest in the Malvern area’s pubs and clubs. Each team consists of 9 players (although teams can sign as many players as they wish), league matches consist of 5 ‘legs’ (each player bowling 3 balls), the winning team of each ‘leg’ gaining one point. The team scoring most ‘pins’ overall is also awarded 6 points. League matches are enhanced with team (Ken Baker Cup), 4 a side, doubles and singles cup competitions all played on Thursday evenings. The league was formed in the early 1970s and is based around the Vale of Evesham and surrounding districts. It is played mostly in Public Houses, Working Men's Clubs, British Legion Clubs, Social and Recreational Clubs within a 12 - 15 mile radius of Evesham in Worcestershire. The league consisted of six divisions with a total of 72 teams competing These teams play from Monday to Thursday during the season, which stretches from early September through to late May. Teams included both men and women. The Evesham League game has been structured upon the Long alley-Western type of game, whereby 9 pins are formed in the shape of a diamond facing the player The pins are normally placed upon a steel plate, which bear markings to identify placement of each pin The League allows pins to be made from either wood or high density polyurethane and the design is based upon the 10" Gloucester pin Balls can be made from wood or composite material and are approximately 4 ¾ " in diameter The League stipulates that the front pin facing the player should always be marked and is known as the 'King' pin. The two pins next to the 'King' pin are also marked and these are known as the 'Quarter' pins All the alleys within the Evesham League are wood and are based upon general guidelines in terms of length and width. Each Team consists of 10 Players, each player playing six legs consisting of 3 balls per leg. The game consists of 6 legs for each team, each player bowling once(3 balls) per leg. Points are awarded on the basis of each leg won, plus a further 6 points for an overall win, making a full six leg win 12 Points. Many years ago the League introduced a system of play, whereby each player bowls alternatively against a player of the opposing team for each leg. This proved to be a successful format creating tension and excitement down to the last leg - last man. The game is also very common in the southwest counties of Cornwall, Devon, and Dorset. In Dorset some games are played by bowling a technique known as the 'Dorset flop'. This is where the bowler crouches on the alley and throws himself and the ball forward landing on his stomach and letting the ball go between two bowling lines. In some parts of Somerset the ball has to hit a pitch plate (a diamond painted on the alley) in order for it to be a legal ball. It is also popular in South Wales. In the Newport and District skittle league (started abt 1927) Men only teams are made up of 12 players playing in groups of four v four (three sections) each playing 3 legs of 3 balls, the league did have 7 men's divisions of up to 15 teams but now down to 4 divisions, Premier, 1st, 2nd and 3rd (2016/17). In 2012/13 season the scoring changed from 2 points for a win and 1 point for a draw to 1 point for each leg and 2 points for the game. If the leg are drawn no points are awarded; however, if the game is drawn the a point is awarded to both sides. There is a Ladies league that is played on a Tuesday. They also play in the summer (started abt 1979) a mixed league. This has 3 divisions (2017), playing for 2 points a leg and 3 points for the game. There are cups to play for which are 8-a-side and also singles, pairs and fours. In 2016, Divisions 1, 2 & 3 were won by Dean Street, Windsor A and The Nightingale respectively. In the Conservative league (Men only), the scoring is slightly different, with 1 point for each leg and 2 points for the game. However, points are shared between both sides for a draw for the legs and the game. The jeu de quilles de neuf ("nine-pin skittle game") of France, also known simply as quilles de 9 or just quilles, is a complicated variant with similarities to both British skittles and pétanque. It is popular only in the southwest of the country. It is an indoor game which is played on a hard-packed surface. The skittles are placed on a square court, each resting on a round piece of wood called pitere or pitet, 2.20 m apart from each other. A skittle measures about 96 cm and weighs 3 kg, and is made of beech wood. The bowl (ball) weighs about 6 kg and has a 30 cm diameter; it is made of walnut wood. There is also an eight-pin version, quilles de huit (8), and a version played with a mallet, quilles au maillet, which is obviously related to ground billiards and its variants such as croquet and paille-maille, and which has experienced a resurgence in Gascony since 1973. The Irish sport is a game played with five 3-inch-high (76 mm) pins and three 9-inch-high (230 mm) pieces of wood (skittles). Pins are numbered from 1 to 5, each representing a number of points. Throwers must toss the skittles towards the pins over a distance of approximately 8 metres (this varies from county to county) in order to score points with the aim to scoring exactly 41. Points are recorded in descending order. If a player should score too many points ("go bust", as in darts) they return to a score of 9 left, unless their previous score was above this in which case they return to that score. The game is played frequently in pubs and Gaelic athletic clubs in various parts of the island with team leagues and cup matches. The German sport kegel or nine-pin bowling is played with nine pins in broadly organized leagues and is also popular in many other countries with long German connections, including Austria, Switzerland, Serbia, Slovenia, Croatia, Hungary and Liechtenstein. The game was once also the dominant bowling game in the United States (but today only survives in rural Texas), and is currently developing in Australia. Any Old How: a ball that has missed its intended target, but has knocked over quite a few pins that count towards the score. Backboard: a small optional plank behind the player and/or playing mat- some players like to rest their heels on it during play. Back-Stabber (Gloucestershire): a ball that knocks over the back pin only. Known as a “Taylor” in the Westbury league. Ball: the wooden ball rolled at the skittles. Beaver: when a player knocks down no pins in a hand. Birdie: Worcestershire term for the pin in the centre of the frame, immediately behind the front pin. Also known as "bird in the cage" or the "Landlord". Bobby: Also known as the front or king pin. Bolter (South Wales): a ball that fails to hit any pin. Broken frame: a frame with some pins knocked over. Cheese: a round, flattened wooden discus (often made of lignum vitae), shaped like some types of cheese, which in some variants of the game is thrown instead of rolling a ball. It may also be rolled, like the oblate ball used in the game of bowls. It is particular used in deck skittles. Copper: the pin on the extreme left or right of the frame. In Worcestershire the term 'Copper' is an alternative name for the front pin or 'King' as it's also known. Cush: the rails on either side of the alley, usually made from timber. Some alleys have ditches/gutters instead (similar to ten pin bowling). Cut: when the ball hits the side of a pin. Dam Busters: The Dam Busters March is hummed loudly in unison when a player accidentally bounces a ball down the alley. Ditch: an area behind the pins that has been dug into the floor. It catches the pins that are knocked down. Down: the scores for all players in one set during a single hand, combined, e.g. "we just got a 24 down"
Duck: a player's score when he or she doesn't knock down any pins on their turn. Used to be referred to as a Jon until October 2016 when it was renamed as a "Senior Hill". Fat Annie: Bristol and Somerset term for the middle pin, as in Birdie above. Flattener: same as strike, flopper or floorer (q.v.). Flopper: when a player knocks down all nine pins with one ball or cheese. Frame: the full set of pins (usually nine) standing upright. Front-for-one (Bristol): Where the front pin is struck without felling anything else with a single ball. Good strike: Denotes when after the first ball the remaining Pins stood up are able to be knocked down with the second ball for a spare. Hill gap: The Gap between the front pin and the front quarter pin, known as Ian and Darren respectively. Landlord: the pin in the centre of the frame, immediately behind the front pin. Also known as "bird in the cage". Long Three: three pins that are situated in a straight line when they are the only pins left standing and the player is trying to hit them down. No Ball: same as foul. Old Market (Bristol): Where the three front, middle and back pins are all felled by a single ball. Considered bad luck as it offers a poor remaining frame. One ball skittler (Bristol, Worcestershire): Where a player uses only one ball to good effect. Frowned on by purists. Plate: the strip on the floor which the balls have to hit when they leave the skittlers' hands. In Worcestershire, Bristol and North Somerset the plate is the square which the pins are stood on. Punch: when the ball hits the pin dead centre and ploughs through afterwards knocking down the pin behind but not the pins either side. Quarter slasher: a player who seems to score well despite always hitting the quarter pin, rather than the front pin. Running three: three pins running diagonally left to right or right to left. Sidey: a ball played that hits the side of the alley. Skittle alley: a long narrow building in which skittles is usually played. Skittle the noise made when the skittles fall. Skittler's Nine (Worcestershire, North Somerset and Gloucestershire): a nine achieved where a spare has not been possible, i.e. when the front pin has punched the middle and the back pin out. Spare: when a player knocks down all nine pins with 2 balls, allowing a third throw with the pins re-set. Split: The pins left after the first ball has been played. Spider (Worcestershire): when a player fails to knocks down any pins in a hand with his or her three balls. Spot: The marks on the plate which the pins are placed. Sticker or sticker-up: a person who puts knocked-over pins back upright. Strike: hitting over all the pins within one turn. V/c: used to denote a beaver or sunshine when chalking, also an alternative for those names in North Somerset—said to stand for "very close"
Trough: a feature on most skittle alleys (constructed out of wood or plastic with a slope)that is used by the sticker-up to return the balls to the players end of the alley for the next go. Winger (Worcestershire): Either of the two pins at the extreme right and left of the frame. Devil among the tailors: another miniaturized version, in which a small ball is attached by a chain or string to a vertical pole, allowing it to be swung through the air in an arc to strike the pins. This game is seen in the British television period drama series Downton Abbey in episode 2.3. The game is seen being played in the library scene before dinner. A 10-pin version of this game was produced by Aurora Plastics and was sold in America under the name "Skittle Bowl" (©1969). 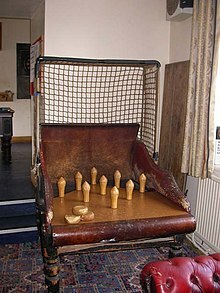 In the English Midlands, specifically Northamptonshire, Bedfordshire, Buckinghamshire, Leicestershire and east Warwickshire, nine skittles are placed on a hooded table, hence the name "hood skittles". The hood skittles table is leather bound, and has leather-cushioned rails to the sides and the back, with a curved hood of leather or netting stretched up from the rear like a pram, approximately a metre over the bed of the table. Behind the area where the skittles are laid out in a diamond is a lower surface or trough. The table playing surface stands about 1 metre high and the thrower about 3 metres from the front of the table when in a pub around Leicester or Rugby, or about 3.3 metres when playing in Northamptonshire or Buckinghamshire. The player throws oblate "cheeses" rather than spherical balls, similar to those used in the game of bowls. The skittles are about 15 cm high, circular at the bottom but widening higher up then tapering to a shallow point, which leaves them slightly top heavy. Traditionally the skittles and the cheeses are made of English boxwood. The cheeses measure about 10 cm across, and 4 cm high, one and a half inches high. A player's turn consists of three throws, with the skittles set up in a diamond pattern. If all nine are toppled, either in a single throw or as a combination of the first two throws, they are reset and the player uses their remaining cheeses to continue knocking them down. One point is scored for each skittle toppled. If the player topples all nine on each of the first two throws, the skittles are reset again for the third throw, allowing a potential maximum score of 27 points on a single turn. It is permitted for the players to bounce the cheese off the cushioned side walls and in some places bouncing the cheese off the rear wall is also permitted. In most versions, the toppled skittles are left where they lie while the player continues to throw the rest of their cheeses, though in some areas in Leicestershire and Rutland players remove dead skittles before each new throw. Once the player has thrown all three cheeses his total is noted and the skittles are all set up afresh for the next player. The area around the table where one or two members of the opposition stand in order to manage the table (i.e., standing up skittles once three throws have been made or removing dead skittles) is known as the woodyard. Scattles is a version of skittles in which all the pins are numbered. Players take turn in throwing the baton at the pins with a view to totalling exactly 50 points. If more than one pin is knocked over, the score received is that quantity of pins. But if only one pin is knocked over, the value on it is scored. If a player exceeds 50, their total reduces to 25. Pins are then placed upright where they stand, thus scattering. Scattles is made by Jaques of London and reminiscent of the older Cornish game, smite, itself based on the Finnish skittles game mölkky. The phrase "beer and skittles" refers to indulgently spending one's time at a pub, drinking and playing the game, and by extension any indulgent, irresponsible lifestyle choice. A table-top version of the game is also featured in the first season of the Netflix series Easy, specifically episode seven. ^ "The Game of London Skittles". London Skittles. The Hampstead Lawn Billiard and Skittle Club. Retrieved 7 April 2018. ^ "sarniaskittles.com". sarniaskittles.com. Retrieved 2014-07-28. ^ "tmsl.me.uk". tmsl.me.uk. Retrieved 2014-07-28. ^ "stroudskittles.co.uk". stroudskittles.co.uk. Retrieved 2014-07-28. ^ Pete Stump (2014-06-11). "berkeleydsl.org.uk". berkeleydsl.org.uk. Retrieved 2014-07-28. ^ "Lates News Page ::The Cirencester District Men's Skittle League". archive.is. 3 January 2013. Archived from the original on 3 January 2013. ^ "herefordskittles.org". herefordskittles.org. Retrieved 2014-07-28. ^ Jon Ponting. "malmesbury-skittles.co.uk". malmesbury-skittles.co.uk. Retrieved 2014-07-28. ^ "Portishead, Pill & District Skittles League :". www.freewebs.com. ^ a b c d Worcester and District Skittles League, Rules and Regulations 2011. ^ Worcester and District Skittles League. "Worcester and District Skittles League". ^ "w-f-s-l.co.uk". w-f-s-l.co.uk. Retrieved 2014-07-28. ^ Malvern Men's Skittles. "Malvern Men's Skittles". Archived from the original on 2016-03-03. ^ Menvielle, Claude (2009). "The French Nine Pin Skittles Game". Castelnau-Chalosse, France: Comité Sportif National Quilles de 9 de la FFBSQ. Retrieved 2009-06-18. In French and English. ^ Martin, Gary. "'Life's not all beer and skittles' - the meaning and origin of this phrase". Phrasefinder. Wikimedia Commons has media related to Skittles (game). This page was last edited on 26 March 2019, at 06:19 (UTC).